An illustrated talk by Mathew Denney : 6 years after the end of the 2nd World War, and exactly 100 years since the famous Great Exhibition of 1851 – the Festival of Britain was a display of might and fortitude on a national scale, showcasing the best of British manufacturing. Mathew Denney will be speaking about the Festival of Britain and its impact on the country. Woodmead Halls, Hill Road, Lyme Regis DT7 3PG. Organised by U3A Heritage Coast, Lyme Regis. Free to members, non-members £2 donation suggested. Coffee served from 10 to 10.45 followed by talk at 11.00 until noon. To join U3A see website www.lymeregisu3a.org or telephone 01297 444566. Lyme’s festival of jazz A five-day festival incorporating the best of jazz, soul and funk in the stunning seaside setting of Lyme Regis over the May Spring Bank Holiday weekend. It features nationally acclaimed headline acts in the iconic Marine theatre as well as a free music festival (Sunday 27 and Monday 28) on the seafront showcasing emerging local talent. Check out: www.jazzjurassica.co.uk for more details and tickets. Come along and join in the musical takeover of Lyme Regis! Busk as a solo artist or bring your whole band. Bring your own instruments or have a go on our play-me-piano or play-me-drums. Coinciding with the Jazz Jurassica Festival Lyme Regis will be filled with music, with performances by young people as well as older musicians and groups. There will be workshops and activities for all ages including ukuleles, beach-hut jamming, drumming, crafts and a pop-up choir. Email today to book your busking slot, and put the date in your diary! B Sharp’s team will be there to greet and guide you. We would love you to take part! Book your time and pitch If you would like to take part in any or all of the busking opportunities or make your own, please contact us. Booking is advised to secure your preferred time and place but you can turn up on the day and sign in at the Welcome Desk on the seafront in the Marine Parade Shelters. Please support us If you would like to sponsor us or make a donation: £100 would pay for the piano installation; £75 would pay for the drum installation and a £25 donation would contribute towards the costs of transporting young buskers to Lyme. With your support we can help more young people to take part in life changing musical experiences towards building a sound future. Contact: busking@bsharp.org.uk or call 07947 334138. 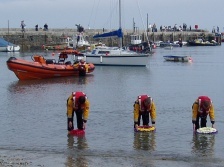 This year Lyme Regis Lifeboat Station is offering a chance to meet the crew and some family entertainment prior to the Blessing of the Boats, from 9am - 2pm. MillFest: National Mills Weekend is the annual festival of our milling heritage, providing visitors with a fantastic opportunity to celebrate working watermills. Just eight months ago this Class was learning how to sharpen chisels and make dovetail joints. Now they’re making boats as part of their training on our intensive 38 week ‘Boat Building, Maintenance and Support’ course. You can read what brought each student to the Academy on the class page and follow the progress of the boat builds here. Permitted on Back beach & Church Cliff to the East & Monmouth Beach to the West. Andrew Millington – formerly director of music at Exeter Cathedral – will be with us again as guest conductor, while our own musical director, Alex Davies, will accompany the concert. Andrew’s career in cathedral music has spanned 40 years, most recently at Exeter, where his work with the cathedral choir included broadcasts, recordings and tours of Russia, France, Norway and the USA. He studied the organ at Worcester Cathedral before going up to Downing College, Cambridge, as organ scholar. In 1975 he became assistant organist at Gloucester Cathedral and in 1983 organist and master of the choristers at Guildford Cathedral. Open air, inter-denominational service, starting at 3pm, visitors and residents are invited to take part. The service is held every year on Rogation Sunday to remember those who have given their lives at sea. 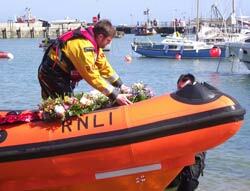 This year, weather permitting, the service will be supported by the town’s gig, sailing and powerboat clubs. At the end of the service three floral wreaths and a poppy wreath from the British Legion will be taken aboard the RNLI lifeboat and laid at sea. The world-renowned exhibition, on loan from the Natural History Museum in London, features exceptional images which capture fascinating animal behaviour, spectacular species and the breathtaking diversity of the natural world. Wildlife Photographer of the Year is the Natural History Museum’s annual showcase of the world's best nature photography and wildlife photojournalism on one global platform. Seen by millions of people all over the world, the awarded images shine a spotlight on nature photography as an art form, whilst challenging us to address the big questions facing our planet. Open to the public from 10 am to 5 pm. Free Entry. Do take advice about safe tide times before setting off for more than fifteen minutes hike, without a guide, along our beautiful beaches: - what appears to be an easy bit of ground to scramble over is more likely to be a treacherous mud slide - don't take a chance! The end of the 38 week Boat Building Course. Students will walk their boats down to Lyme Regis harbour where they will be launched for the first time. The class have completed their training and the day marks the start of their lives as boat builders. Yvonne Green, Principal of the Academy, says, ‘I’m confident that the students wishing to work in the marine industry will easily find employment. We have an excellent relationship with employers and students join our growing Graduates’ Network which is regularly updated with jobs and opportunities. There is a skills shortage in boat building, which is a thriving industry’.